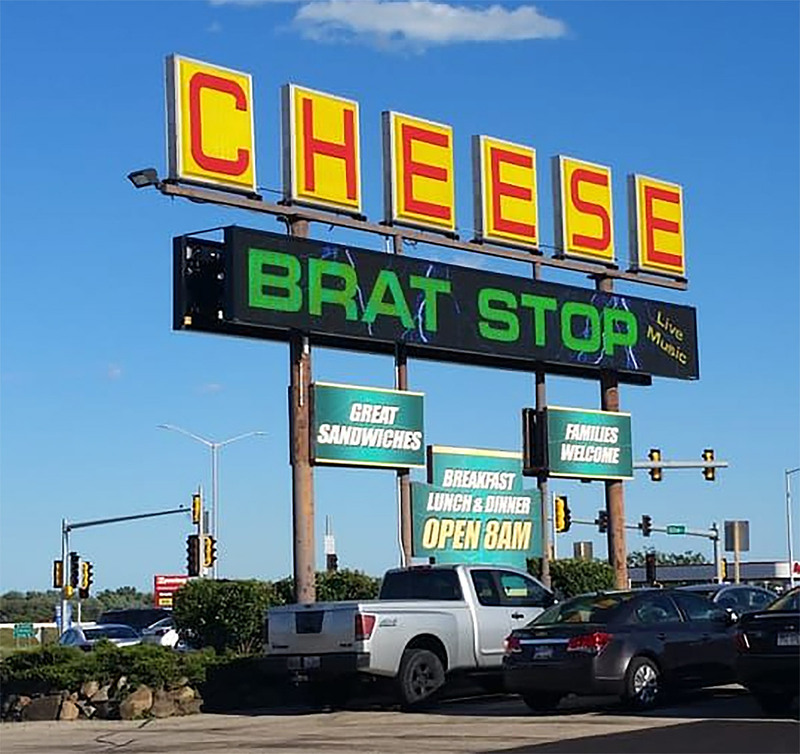 If there was an adult version of Disneyland, The Brat Stop in Kenosha Wisconsin would be it. The ‘hard-to-miss’ sign outside The Brat Stop The Brat Stop offers all of these things and more: sports bar, restaraunt, deli, specialty cheese shop, live entertainment, adult gaming (gambling), video games and of course, pinball! 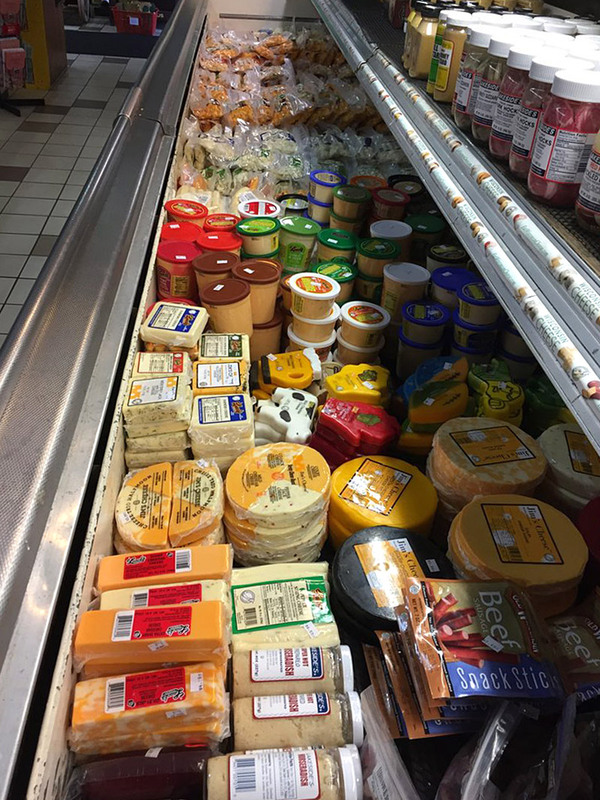 The wide selection of cheeses Clothing and beer in the retail shop Located at the unofficial gateway to Wisconsin, The Brat Stop opened in 1961 as a 1,200 square foot combination deli and roadhouse offering food and beverage to people traveling on nearby Interstate 94. 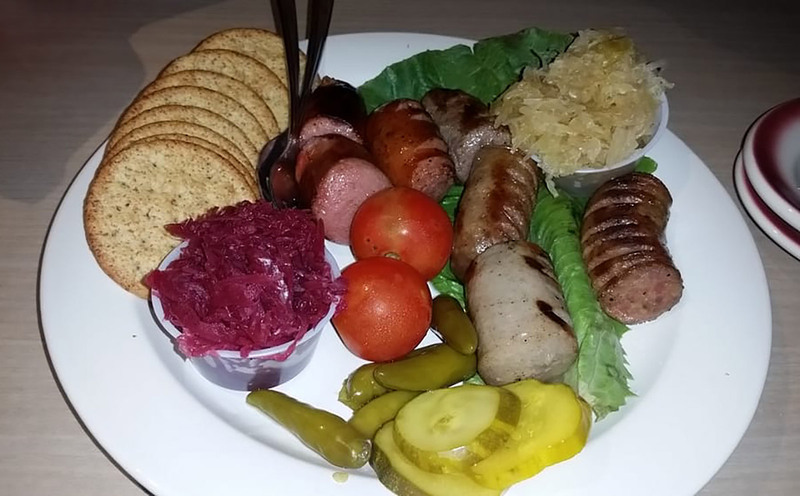 The Brat Stop salutes the beer and brats that are a part of the heritage of the German settlers that made roots in Wisconsin in the 19th century. 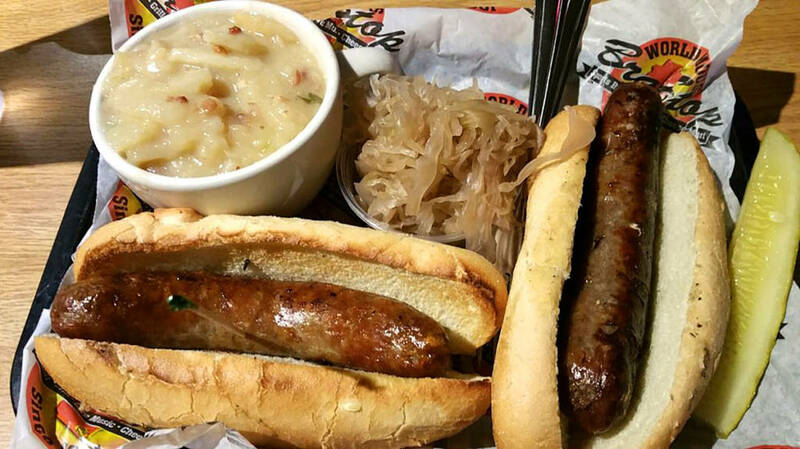 Brats with sauerkraut and potato salad Try the sampler The Brat Stop has grown over the years to 46,000 square feet and has an annex that can be booked for private parties. Many sports, political and entertainment personalities have stopped at The Brat Stop, from Michael Jordan to Phil Jackson and Al McGuire to Tom Arnold, Steven Tyler to Bette Midler, Tommy Thompson and Russ Feingold. TV’s “The Best Damn Sports Show was even filmed here once,” reveals Gerald. Since 1965, The Brat Stop has hosted live music and many well-known national acts. Stars by the likes of The Charlie Daniels Band, Cheap Trick, Foghat, Styx, Eddie Money, 38 Special, Trace Adkins, Tracy Byrd, Jo Dee Messina, Neal McCoy, Chris Cagle and Sugar Land, Lil’ Ed and the Blues Imperials, Suburban Cowboys, Sixteen Candles Band, Justin Yates and many others have all performed on The Brat Stop’s stage. 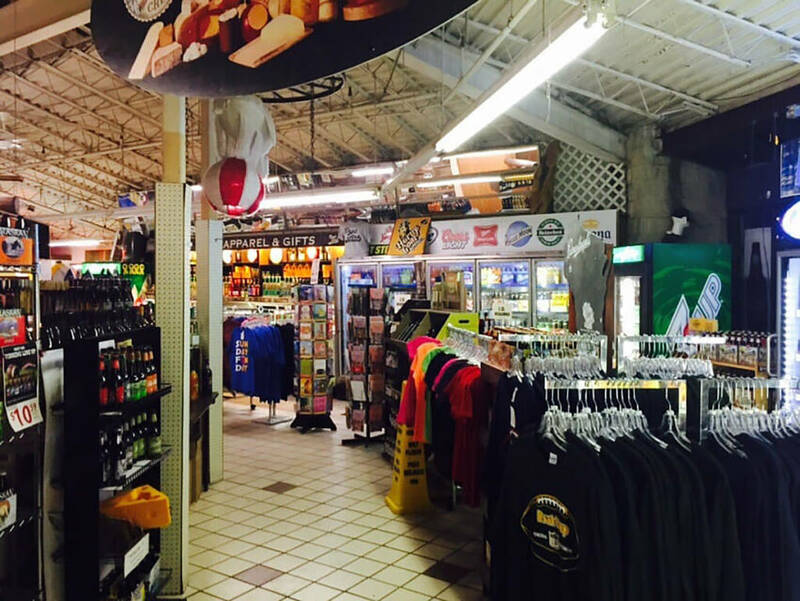 The Brat Stop offers a huge selection of mainstream and craft beers, mostly from Wisconsin brewers such as New Glarus Brewing and Lakefront, as well as a full bar. 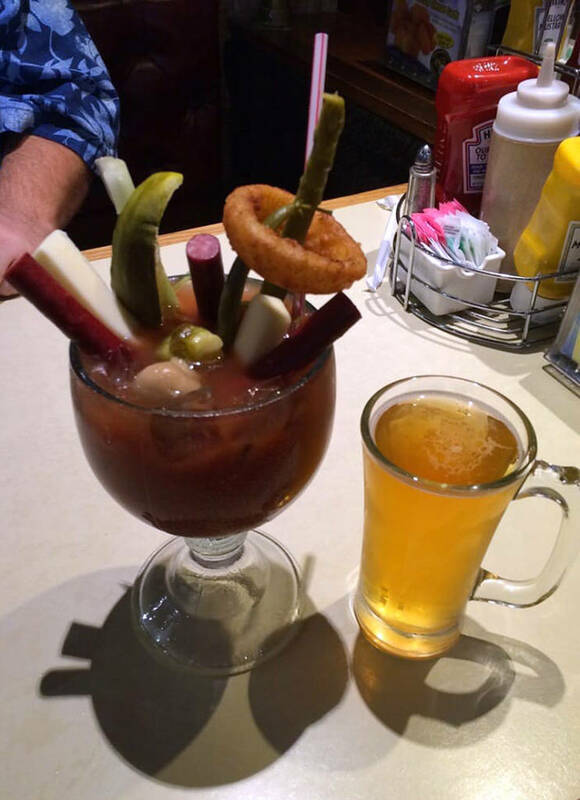 The Brat Stop Bloody Mary is legendary in the southern Wisconsin area and is affectionately known by many as ‘a meal in a glass’. 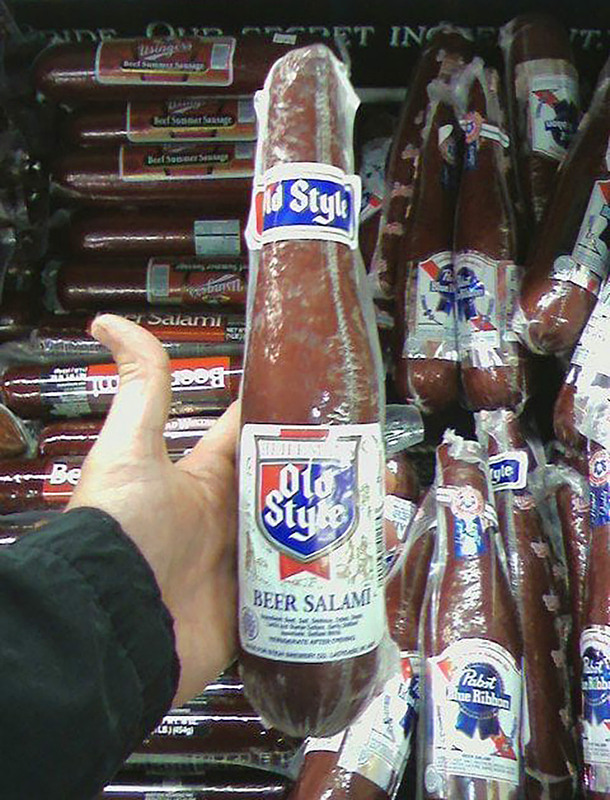 The beer selection Truly a ‘meal in a glass’ Can’t choose between beer and brat? Why not both? 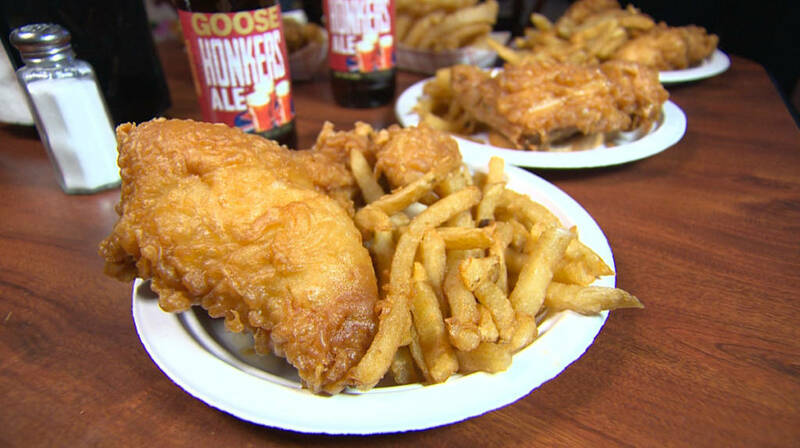 The Brat Stop is also a favorite location to enjoy the classic Wisconsin ‘Fish Fry’ on Friday evenings. Their Fish Fry includes a side of cole slaw, German style potato pancakes with your choice of sour cream or applesauce toppings, or you can request their french fried potatoes. 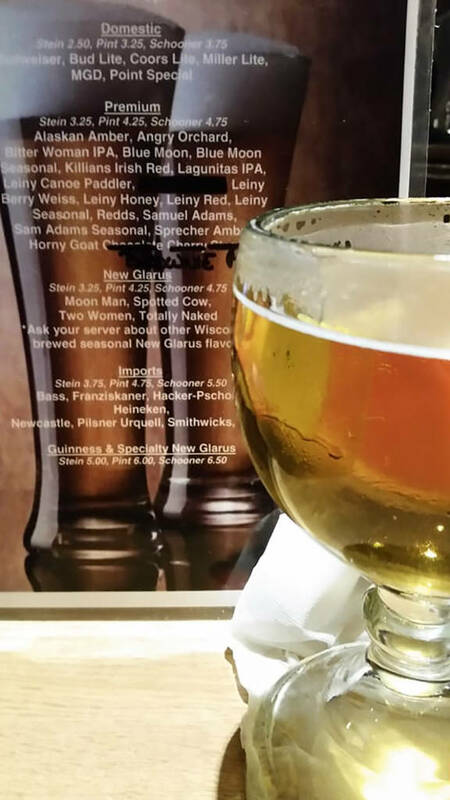 It’s Fish Fry Friday Games have always been a part of The Brat Stop, but recent changes in ‘adult gaming’ (gambling) laws have allowed The Brat Stop to add a bank of slot and video poker games to the north wall of the main bar. The pinballs, video games and claw machines that had been in that area were moved to the south area of the bar overlooking the stage. When I visited The Brat Stop recently I played the two games listed above – they were in typical condition for games that were placed on location by an operator. Spider-Man They had no broken parts but could use a good cleaning and some TLC. Both games were set to $1/credit or three credits for $2. Free game thresholds were average-to-slightly-high. There is a change machine nearby, or the bartender can also help with change. 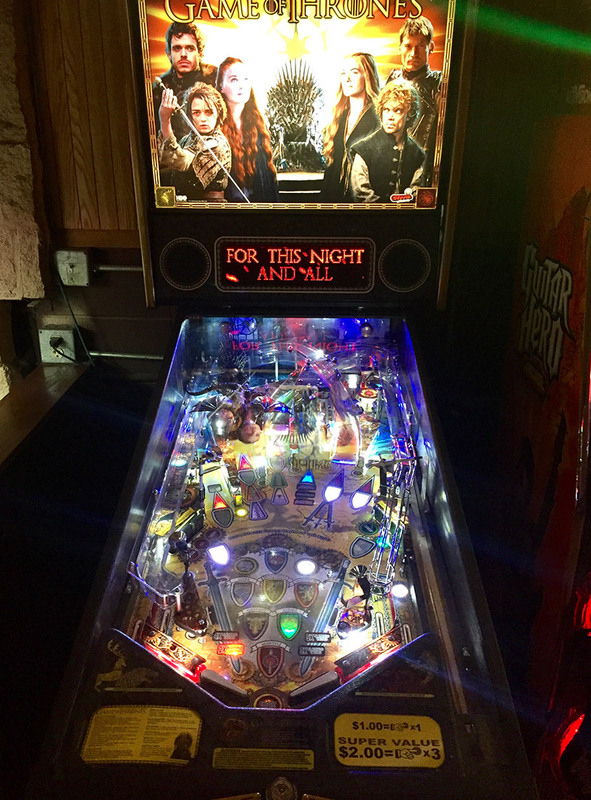 Game of Thrones The operator swaps out the pinballs and other games about every sixty days, so when you visit it is likely that there will be different games to play. 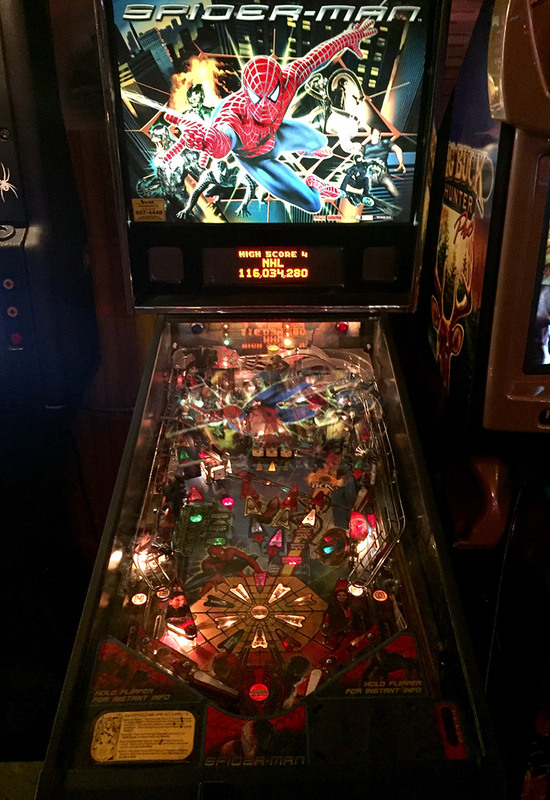 Few people that I know go to The Brat Stop to play Pinball- they usually are there for the food and beverage as well as the entertainment. That having been said, it is nice if you go to watch a football or hockey game on their big-screen TVs, to have the option to play a game or two at half-time or between periods.